Condition is Used. T wo front pockets, concealed frontfastening. Uk b id de rs only. Fishtail detail on rear hem. Dark Grey Parka. Plenty of wear left in this beautiful parka. A versatile and comfy parka that is sure to keep you warm in cooler temperatures! This stylish coat features an empire waist design, zip hood with faux fur lining and trim, plenty of pockets and quilted lining. New knitted designer style Jacket from John Lewis. New, Unworn. A really lovely jacket. 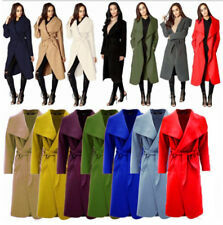 The style is slightly oversized and will fit L/XL. Wool 55% Polyester 30%, Mohair 15%. Buttons fastening with ribbed cuffs that can be turned up. A CHOCOLATE BROWN COLOUR WITH A SLIGHT TONE OF KHAKI. LINING IS A KHAKI AND BROWN LEOPARD PRINT SATIN. THIS IS FOR A GREAT COAT. 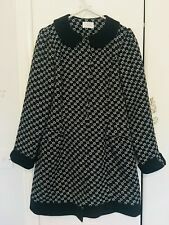 ONE BUTTON IS MISSING DOWN THE FRONT, IF YOU WEAR A CHUNKY SCARF WITH THIS YOU WILL NOT NOTICE OR YOU COULD TRY AND FIND A MISSING ONE. 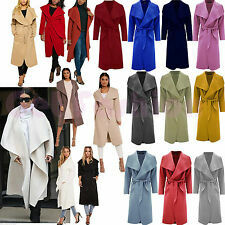 Whatever Your Shape Or Style This Winter, Stay On Top Of The Trends This Season With One Of These Ladies Designer Parka Coats! STYLE LIGHTWEIGHT PARKA. COlOUR BLACK. SIZE UK-16. 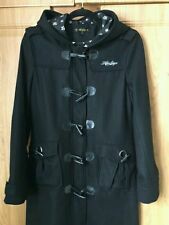 BNWT Size 18 3/4 Lightweight Black Jacket. Polyester - three buttons. Excellent unused condition. 46" underarms x 31" long.